Mountain Bike in the Dolomites – one of the greatest cycling regions of the Alps – with challenging ascents, exhilarating descents, and breathtaking vistas at every turn. Explore the Dolomites by Mountain Bike or E-Bike – from gentle fire roads to rugged steeps, taking in incredible landscapes. One of the best ways to explore the Dolomites is by mountain bike – you can cover a lot of ground, and take in the variety and beauty found in these mountains. High passes followed by lush, green valleys create dramatic ascents and descents that make for exhilarating bicycling and sightseeing alike. “Bike friendly” hotels and rifugi make multi-day, hut-to-hut rides possible. And you know you’ll have earned the hearty South Tyrolean meals at the end of each day! Daily excursions are limitless, and whether you prefer easy mountain biking on gravel or fire roads, or challenging yourself on an exposed single track, Dolomite Mountains has itineraries for mountain bikers of all abilities and interests. NEW! E-Bike in the Dolomite Mountains! Always wanted to mountain bike in the Dolomites, but not sure you’re up to the challenge? Then why not try e-biking! E-bikes – or electric-bikes – look like, pedal like, and handle like regular bicycles, but they have a re-chargeable electric motor to help you out. You just set your e-bike on the amount of assistance you want, and pedal just like you would on a regular bike. Imagine your uphill rides being just as relaxed as your downhill ones; on an e-bike, you can go further and explore more terrain that you might be able on your own. Want to extend your trip beyond the Dolomites? Check out our Trip Extensions! Try out an E-Bike! 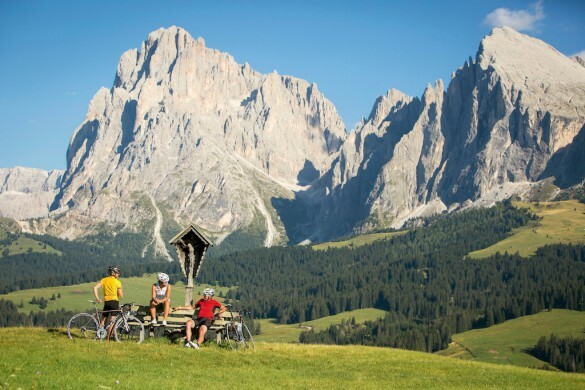 Bicycle over 4 spectacular Dolomite valleys, enjoying fabulous ascents, descents into beautiful, and vistas of deep valleys surrounded by jagged Dolomitic peaks throughout! 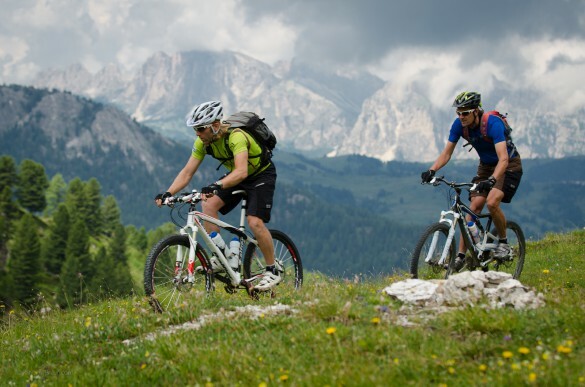 Traverse the Dolomites on an electric mountain bike, from Alta Badia to Cortina and back! On an E-bike, the pedal assist allows you to explore further in these mountains than you could on your own steam. Mountain bike on the Alta Via N.1, the best-known long-distance high route in the Dolomites. Ride through beautiful and challenging terrain, surrounded by limestone peaks and lush valleys and meadows, exploring the vast and varied beauty of these mountains. 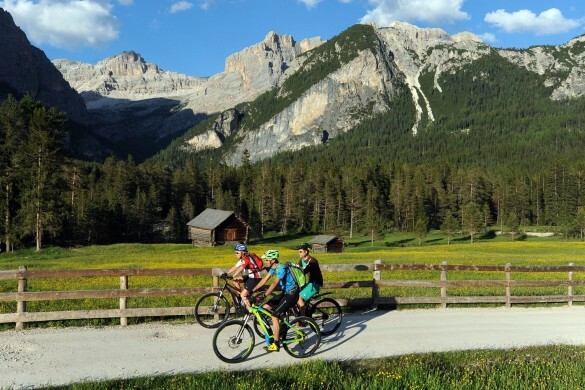 Explore challenging mountain biking trails from “base camp” hotels in both Alta Badia and Cortina d'Ampezzo! Ride through these Ladin Valleys, and experience the different Italian, Austrian, and Ladin cultures and traditions, while taking in the vast beauty of the Dolomites.